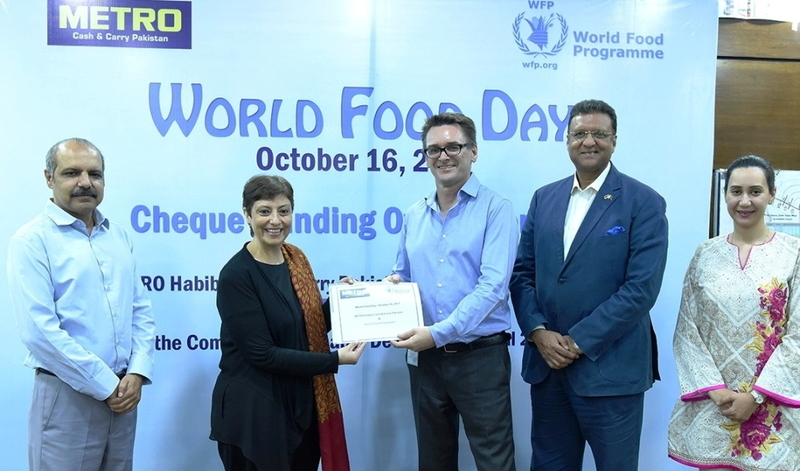 KARACHI: Metro Cash & Carry Pakistan (METRO) has join hands with World Food Programme (WFP), as part of their global partnership with the United Nations agency mandated to combat hunger around the world. This is an opportunity for METRO to help WFP advance towards the second of the UN’s Sustainable Development Goals: to “end hunger, achieve food security and improved nutrition, and promote sustainable agriculture by 2030”. As part of the effort METRO Pakistan handed over their first fundraising cheque, that included contributions from cause-related marketing and its employees, to Ms. Cecilea Garzon, Head of Nutrition Unit World Food Programme Pakistan by Marek Minkiewicz, Managing Director Metro Cash & Carry Pakistan. Also present at the occasion were Ms. Zahra Hussain Director HR and Mr. Pervaiz Akhtar Director Corporate Affairs from METRO Cash & Carry Pakistan, and Shahzada Rashid Mehmood Chief World Food Programme Punjab.